I can’t believe that I have been blogging professionally for 6 years now. During the course of the last 6 years I have owned and operated 8 different blogs, managed over 100 contributing writers, and have created more content than I thought humanly possible. I have spent thousands and thousands of hours writing, re-writing, creating images, recording and editing podcasts, publishing books, curating blog series, networking, using social media, emailing, engaging and building community, and several other things that go along with what being a professional blogger takes. 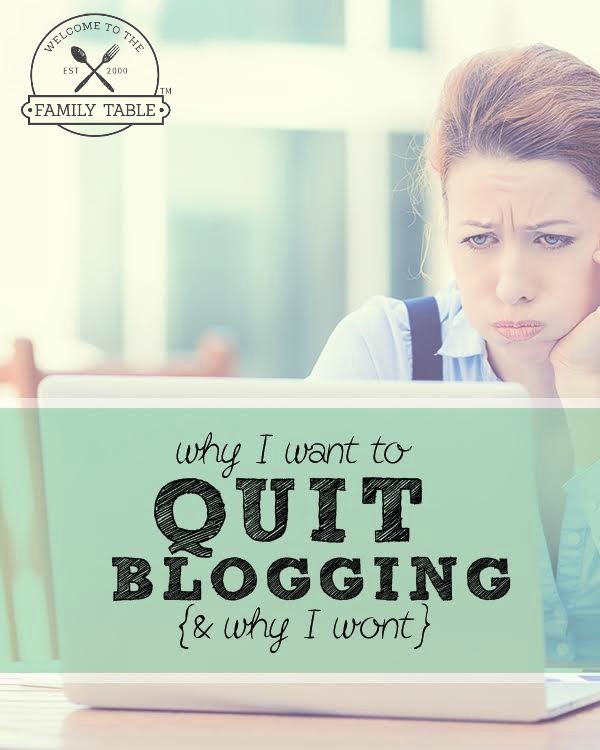 Just yesterday (and many times before) I told my husband I was going to quit blogging. He smiled and said, “Hang in there honey, you can do it.” Because he knows me. I can do it, and will continue to do it. But today I want to share with you my heart behind why I want to quit blogging and why I won’t. Hopefully this will register with someone who is feeling the same way or someone who is looking into professional blogging. I wish I had read the words that I am about to spill out of my heart before I started. I believe they would have helped tremendously. And it is my prayer that these words and thoughts I am going to share will help someone out there today. So without any further ado, here is why I want to quit blogging and why I won’t quit blogging. 1. I want to spend more time with my children. I have been blessed to be a stay-at-home homeschooling mom since we had our first child over 16 years ago. This was a choice my husband and I both made even though impossible circumstances seemed to tell us that I had to work. We chose to believe that God would help us live frugally and understood that we’d rather live poor so I could be with our children. Because to us, this was really more important than having “things”. While we faced many, many hard choices and had very little money for the first several years of our marriage, we wouldn’t choose any other life. Because I have always been home with my children, I feel like I am robbing them of time with me and contradicting the very reason that I chose not to begin my law career all those years ago. Is this what I really want to do? 2. I don’t enjoy being engaged in a rat race. Just like anything else, if you get caught up in the “latest trends” and what the “biggest bloggers” have to say, blogging can become an ugly rat race. And honestly, why are we giving others permission to tell us how we run our businesses? I really dislike anything that tries to tell me that there is “one” way of doing things. And the truth is that we all have different missions and reasons for why we start our blogs. Different stories. Different areas of expertise. Different beliefs. Different lenses to share our information through. I don’t engage in rat races; never have and never will. How boring would this world be if we all did everything the same? It’d be horrible. Don’t get me wrong, the entire blogging industry isn’t telling everyone to be the same – but there is definitely a small subset I have found that do. And really it is so they can make money off of those who so desperately want to make it “big”. So I simply don’t involve myself in those circles as I am not interested in pitting myself against other people. Nope. I am quite comfortable being who I am and doing what I am called to do. I still love learning all I can through books and ecourses to expand my online business, I just refuse to conform to the rat race and be just like everyone else, flocking to those “blogging gods” that seem to know what I should do just because their bank accounts are fuller than mine. No thank you. I’ll stick to doing what I am doing and the way that I do it because it is working well for me. And that’s what really matters is that it is what is best for my family and I. 3. Because a lot of people consider bloggers to be unethical. I have seen my fair share of shady bloggers and blogging practices these last 6 years that would make anyone cringe. But if I am being honest, the vast majority of those who stick in this profession for the long haul are actually interested in seeing this industry thrive and for us to be recognized as a legitimate way to earn a living from home. Because after-all, it is. Often times I find myself emerged in conversations with family and friends who confuse spammers with the world of professional blogging. There is a difference. A huge difference. But I still get asked often by those who know little to nothing about blogging if the industry as a whole is unethical. And I get into conversation after conversation explaining that most of us are ethical. But I am certain most still walk away skeptical. 4. Because it is hard. Until you actually start making money as a blogger, you just don’t realize how hard blogging is. Blogging is just like any other reputable profession – it is full of sacrifices and lots of hard work. There are times where you feel overworked, underpaid, and under appreciated. There are times when you question if it is all really worth it – does anyone even care what I have to say or realize the hard work I go through to provide FREE information on my websites? No, probably not. But that’s not why I do it. I do it because I want to and even then, it’s still hard. And time and time again, I want to quit blogging. But I don’t and I won’t. Interestingly enough, the first reason that I named above for wanting to quit blogging is also the first reason why I won’t quit blogging: I want to spend more time with my children. We are currently finishing up our 12th year of homeschooling and the fact that I’ve been able to make a living, continue to homeschool, and be available every day at home with my children has been such a blessing. So this is one major reason that I will not stop blogging. Blogging has allowed me the ability to spend more time with my children and our time together is much more purposeful. Because I am so intent on being available for my children, I work that much harder to be certain our time together is spent doing things that will bring our entire family joy for years and years to come. 2. Because I love to help others. Helping other people has been my passion since I was a young child. I love to learn as much as I can every day and love to share that information with those who are hungry for it. There is nothing that gives me more joy that the ability to share what I have to help another human being. So even though I may not be able to travel the world every day; through my blog I am able to reach an international community of amazing people who are looking for some insight that I am able to give. I believe that we all have unique gifts that the world will benefit from. Being able to reach outside of our local and national geographical location to help others is a dream come true. What better way to spread the love of Christ than through our blog? We are so grateful for this tool to give back to the world some of the blessing we’ve received. 3. The freedom to work when I want and where I want. This has been one of the biggest blessings for our family. There have been so many times where I had a big project due for a sponsor or a product launch that ended up being right in the middle of a vacation we’d been planning for months. Although I do my best not to work while on vacation, as long as I have an Internet connection, I am able to still meet those unexpected impending deadlines. Oftentimes if I have to do a little work while on vacation – I do it when the (younger) children fall asleep at night or poolside while the family enjoys swimming. However it happens, it is flexible, and I am still able to be with my family. This is a double blessing in my book! 4. Teaching our children valuable life lessons. After lots of prayer and reflection over the years, I had the realization that it was good for them to see me work. I also came to realize that by not always being available to them they were learning valuable skills about self-sufficiency and many things listed above. And as a homeschooling family these lessons may not have come as quickly to them if I was always available. 5. Money to create even more family memories. You may not know this, but I started blogging while living overseas in Germany in 2011 while my husband was serving on his 5th combat tour in the Middle East. One evening while praying for him and his soldiers, I knew that God was telling me I needed to start a blog. I was a bit reluctant at first, but a few weeks later my first site, So You Call Yourself a Homeschooler? was born. 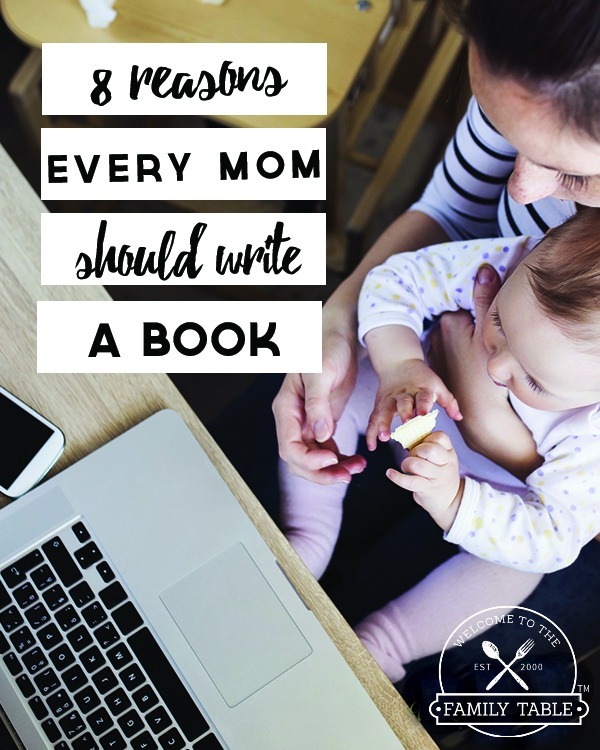 It was during that first year of blogging while my husband was in Afghanistan that I earned enough money to take our family on a 10-day European vacation. One of the fondest memories the children have was the last leg of the trip going to Europa Park (Europe’s equivalent to Disney). I don’t think a day goes by that something isn’t mentioned about that trip! Since that trip I’ve been able to pay for so many things. From paying for entire vacations for our family of 5 to paying cash for new vehicles and more. And even better – we’ve been able to give lots more of our finances to those in need. This is something that I am so very grateful for. It feels so amazing to be able to serve other families while earning a living. If you want to quit blogging; you are not alone. If you are feeling like you want to call it quits, I encourage you to reevaluate the reason why you started blogging and how it benefits your family and those you are called to encourage and educate. I encourage you to take a blogging break and allow your heart and mind to rest. I encourage you to make a list of pros and cons to see if blogging really is for you. And if you find that it isn’t. That’s okay. And if you find that it is, I encourage you to find where your passions lie and follow them. Build a community of like-minded people who can grow and learn together. Learn all you can about your niche and how you can best serve them. Love those whom God has called you to serve, and love them well. I am certain that I will feel like I want to quit blogging again, but I am also certain that I won’t. Beautifully said, Carlie. You hit the nail on the head regarding the realities of blogging. It all boils down to defining your “why” as you have. If your “why” is clear then that will guide your decisions. Thanks for sharing and providing inspiration! Yes! You are so right, Alaya 🙂 Thank you so much for your kind words! Carlie, this post is such a blessing. I still struggle a bit with blogging although I have finally started making an income from it. 🙂 I love the reasons you stated for why you continue to blog. I feel the same way. I think it is important for our kids to see us engaged in things that we enjoy and things that are hard.